Chocolates and Sweets Delivery Gold Coast Australia. Send chocolates or sweets with your flower delivery from Botanique Flowers local Gold Coast florists. Order online or telephone +61 7 55737666. 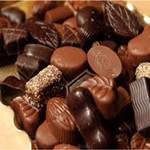 One of the most pleasant effects of eating chocolate is the ‘good feeling’ that many people experience after indulging. Chocolate contains more than 300 known chemicals and scientists are working on isolating the specific combinations to help explain the pleasurable effect of consuming chocolate. We've done a little research on chocolate and the benefits of eating chocolate, click this link to read more of the story. "Feel Good With Chocolates"